For what we are about to receive may we be truly thankful. – Old Naval Prayer. Update 1: 25 Aug 2017 15:15 hrs. 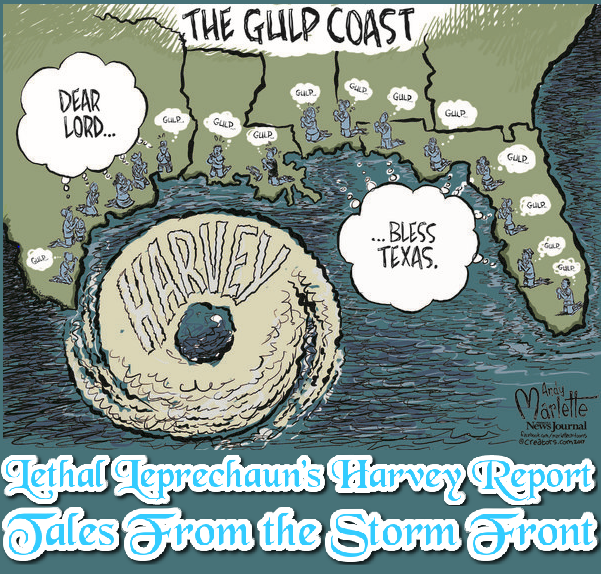 Despite coming ashore as a Cat 4 hurricane in the area it made landfall, Rockport Texas between Port Aransas and Port O’Connor close to 10 PM last night to date there has been only a single death attributed to Harvey. So far we’ve managed well. The heavy stuff started last night between 7 and 8 PM. Early on we had about a 2 minute period where we we’re worried about loosing power but that coincided with some strange noises outside not far away so I think the rain and wind drove a tree branch down into the power lines until it burnt through it. While it rained more or less all night we had some breaks in between the heavier bands which I think helped us a lot. We did have one reported lighting event that was only 0.2 miles away according to my local weather app but that was it aside from some thunder. Currently we are safe, dry and secure. All our services are still on and functioning well, though we are having some minor issues with our internet service, but that is to be expected from past experiences. The wind has not been bad as yet for us though there are some reports as yet unconfirmed by the NWS of several tornados having touched down over night, again well South and East of us. While we have a little minor debris on the ground, its not really any worse than the aftermath of a bad T-storm. We did get quite a bit of rain, around 5 inches of it. Currently we are in sort of a lull period that started somewhere around 11 Am where the majority of rain is South and West of us. As of about 1 PM CST Harvey was downgraded to a Tropical Storm which is good news. The bad news is that it has slowed to from a turtle’s speed of 10 mph to a snails pace of 2 mph and is currently as of writing this in fact stationary about 60 mile E-SE of San Antonio. We are under a Tornado Watch until 2 AM Sunday and I expect that will likely be extended as the last one was extended and modified into the current one. As we just received a Tornado Warning Alert in conjunction with the T-storm cell which is due to arrive shortly. I’m going to post this and shut things down here just in case. I’ll post again if/when I can as things develop. Hope you and your family keep safe during the storms.